It is no longer the days of formal photography when people used to ensure that they are dressed up and look their best. This is the selfie age, where everyone, especially the youngsters loves to take selfies at just about any time of the day. While the selfie craze comes from the self obsessed modern people, the new-age gadgets are very happy to encourage this popular activity. Going by the trend, HTC is also churning out devices that will be adored by the selfie snappers, and the result is the new HTC Desire Eye. Most mobile phones offer a hefty powerful camera at the back of the device for the general photography and a meager snapper at the front for selfies, but the HTC Desire Eye is different. This new phone from HTC knows how important selfies are for today’s generation and thus, offer both the front and rear cameras with great 13MP sensors. Moreover, both the front and back cameras also feature dual-LED flash to enable great photos even in lowlight conditions. Thus, the new HTC Desire Eye ensures that not only the group photos or landscapes are great to look at, but even the selfies are of superb quality. HTC’s experiment with camera setups continues and the Desire Eye’s camera setup is remarkable and its front camera is apparently massive with the cyclopic eye lodged above the screen. The device’s 13MP front camera boasts of two-color LEDs, making it probably the best selfie camera in the market. Obviously, you can’t term any camera as the primary and secondary camera on the HTC Desire Eye, as both the snappers are equally capable. And, HTC also claims that the great front camera has more use than just clicking your own pictures. It is also a great way to connect with your friends and family. As most of the young people love to spend long hours video chatting, this new HTC phone will be a great device for them as it will enable crystal clear video chats. Moreover, the mobile phone will also let professionals to engage in high quality video conferences by utilizing its potent front facing cam. Dimensions: 151.7 x 73.8 x 8.5mm. It weighs only 154gm. Display: The device comes packed with a large 5.2 inch high capacitive touchscreen display with 16M color and 1080p, 423ppi pixel density. Hardware: It get 2.3GHz Quad-Core Krait 400 and Qualcomm Snapdragon 801 chipset. The RAM is supported by a 2GB. Cameras: Both the front and rear cameras come with the same specs of 13MP sensors, auto-focus, dual LED flash and f/2.0 aperture. Video capabilities: Both the cameras offer the same video recording capabilities of Full HD (1080p) recording at 30fps. The HTC Desire Eye is a new overall stunning and very impressive smartphone that should charm the smartphone lovers all over the world. Though it is not that premium looking as the One M8, but it has a bigger display of 5.2 inch and the same chipset. It is also water resistant for up to 1 meter for half an hour. Moreover, the mobile phone offers great audio quality as well with its BoomSound stereo speakers at the front, and records great audio with its array of microphones. This makes it an all-round entertainer rather than just a great selfie shooter. The smartphone also offers some of the best features that you can get your hands on including LTE connectivity option, microSD card slot with huge expandability, the Sense UI enhanced KitKat OS and many other miscellaneous features. 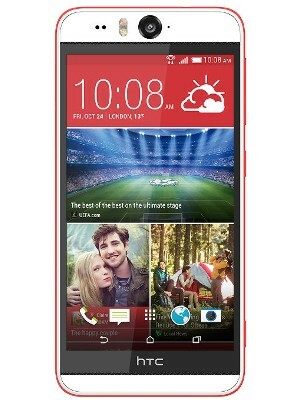 In short, the new HTC Desire Eye has it all, except the impressive metal unibody design and HTC is so famous for. The HTC Desire Eye has a very stylish design with a unique tough at the front, as its 13MP front camera occupies almost the entire bezel on top the screen. Its very size shows that the front camera is really impressive and worthy. The presence of the dual-LED flash at the front also makes the phone look equally strange. However, this also stresses the selfie friendly motto of the devise. The large 5.2 inch touchscreen looks great and offers sharp and crisp display. The smartphone houses three microphones – one at the bottom and one for each of the cameras for the video shooting purpose. Then there are the impressive HTC’s patent BoomSound stereos at the front around the screen, which are hardly noticeable, but are incredible. The HTC Desire Eye unique design divides it into three segments, which is clearly visible in the blue color option, where you see the white front, a light blue trim and dark blue back panel. The other color option shows off a pristine white at the front and rear with a bright red trim in between. The HTC Desire Eye’s built quality is also great. Though plastic, it is a good and sturdy polycarbonate material that is usually offered by Nokia, and feels great to touch as well. However, the smooth back panel is fingerprint magnet and becomes all smudgy after use. 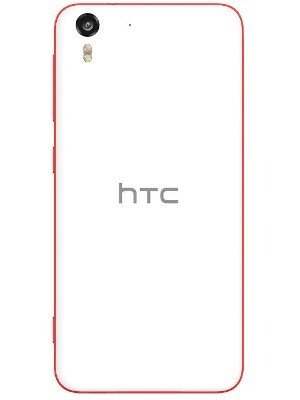 The back panel looks neat as there’s not much other than the same camera setup and the HTC logo. With the new HTC Desire Eye, you don’t have to pose for someone else to take your picture; simply take great selfies whenever you wish to. My search for selfie smartphone ends here after reading your review about this phone. But i don’t like HTC smartphone. Can you please suggest any other selfie smartphone in Samsung or other brands? As per my knowledge, Galaxy Note 4 and Note Edge are Samsung’s best smartphones for taking selfies. You can take a look on some of these smartphones too i.e. Oppo Find 7, Gionee Elife E7 Mini, Micromax Canvas Knight, Lenovo Vibe X, Huawei Ascend G6, and Apple iPhone 5S.